An important conference was held in January at Brown University: “The Present Interglacial, How and When Will it End?” As a result, the following letter was sent to the President. The media has not reported this, but you should be aware of the letter and its significance. It was sent to President Nixon, not Obama. The date of letter: 3 December 1972. The text is from slide 6 of “The Origins of a ‘diagnostics climate center“, Robert W. Reeves and Daphne Gemmill (NOAA), posted at the NOAA website — presented at the 29th Annual Climate Diagnostics & Prediction Workshop, 20 October 2004. It did not include the text of the penultimate paragraph. The last paragraph warned about Soviet science in this area. Here is the text of the presentation. The Science article about the conference was “The Present Interglacial, How and When Will it End?”, G. J. Kukla and R. K. Matthews, 13 October 1972. What happened next, after the President got the letter? To learn what happened afterwards, we turn to “”Global Cooling and the Cold War – And a Chilly Beginning for the United States’ Climate Analysis Center?” By Robert W. Reeves, Daphne Gemmill, Robert E. Livezey, and James Laver (all of NOAA), and presented at The International Commission on History of Meteorology Conference in Weilheim Germany, 5-9 July 2004 (posted at the website of the International Commission on History of Meteorology). The period following the establishment of the ad hoc Panel in early ’73 to the official publication of the report saw a flurry of activity by the various agencies. The National Science Foundation (NSF) and NOAA were particularly active. The NSF had formed a Climate Dynamics Group in the spring of 1974 with Joseph O. Fletcher in the lead, and ably assisted by Uwe Radok. There was also a considerable amount of Washington “hardball” during that period as individuals and agencies competed for the lead. The ad hoc Panel decided that the topic was of such paramount importance that they should go beyond simply reporting their findings, and include a recommendation. This they did with a companion document that was a call for a national climate program to begin addressing the climate issues. Fletcher was instrumental in the companion report’s preparation and had envisioned NSF in the lead. NOAA had other ideas. The memorandum further requested the Department of Commerce to take the lead and chair the subcommittee. Secretary Dent responded on August 16, naming Robert M. White, Administrator of NOAA, as chair of the subcommittee. John Townshend, White’s Deputy, asked William Sprigg to convene a series of interagency meetings to assemble the “United States Climate Program”. Robert Reeves has a Ph.D. in Atmospheric Sciences … and works as a Climate Specialist at the Climate Services Division at NWS Headquarters. The rest is history, as the CAC has grown to become a valuable part of both NOAA and the global science infrastructure. It’s hidden history in a literal sense, conflicting with current dogma and so seldom mentioned. broader and deeper knowledge with each passing year. The following is from the FM reference page Science & Nature – the history of fears about the climate. It’s a list of articles I have found in my research and bothered to bookmark, with no claims to be comprehensive. It gives a flavor for the process, and a starting point for those who would like to learn more about these issues. 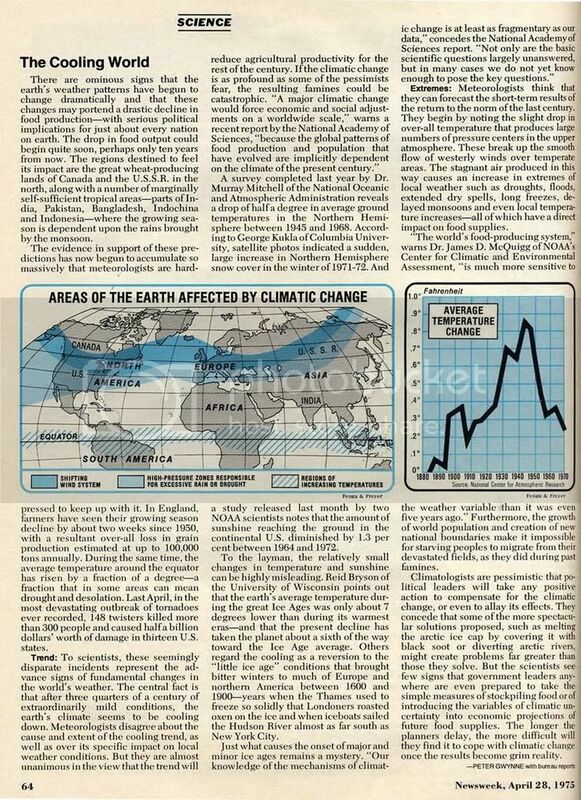 This shows that there was no consensus during the 1970’s on global climate trends. There were areas of broad agreement, esp within sub-disciplines. That’s how science works (esp seen in term of Thomas Kuhn’s theory). And this is true today, as shown by the articles listed here, although the area of agreement has grown far broader after 27 years of research. From another perspective, the division lines have grown deeper, for example between those studying solar influences on earth and those studying AGW — both of which have developed so far since 1972. “A study of climatological research as it pertains to intelligence problems”, CIA, August 1974 (36 pages) — PDF posted at Climate Monitor website here. “Climate Changes Endanger World’s Food Output”, New York Times, 8 August 1974 – Picture of article. The reason why the whole American climate change debate sounds funny to those in Europe is because in America the educated are considered part of the moneyed elite. So conspiracies of the educated against the honest working Americans makes sense. It is striking how close the rhetoric here is to that used to complain about the financial crisis. This is a deep problem in the US. Not only with the US be late to yet another a new industry that is forming, for nothing more than ideological-cultural reasons. But it means that the US will face popular resistance to going high end in response to the Chinese. Nice timeline of climate change! Fringe groups have always been attracted to theories of doom. Since climate is so intimately connected to crops and food supply, climate is a believable source of doom. The US now has the “perfect storm” of government to fall for suicidal doom theories. This is the perfect time to strike at US energy supplies, the heart of US industry and commerce. Prognosis for the US long term is dim under a regime of reduced energy supplies. Also, this is an example of science in action: Much of the work in Quarnery Research (at least according to a trivially uselessly short summary at Connolly’s blog , hardly trustable but the only thing I’ve got) was based around an assumption that glaciation intervals were very fast by geological standards, without the sedimentary data or ice core data that we have today. Improve the data, improve the measurements, and the conclusions dissapear in a puff of “hypothesis invalidated”. Models are not science, they are scientific speculation at best until you can devise predictions and experiments to attempt to falsify them, but measurement is. You’ve also totally missed the point of this exercise. First it shows that there was substantial concern about global cooling during the 1970’s, despite propagandists like Connolly’s attempts to misrepresent the historical record. The second is too obvious to mention (if you don’t already get it, my explanation will not help). And who is this miscreant Pielke, that economist Delong righteously rebukes? Roger A. Pielke, Jr. has been on the faculty of the University of Colorado since 2001 and is a Professor in the Environmental Studies Program and a Fellow of the Cooperative Institute for Research in Environmental Sciences (CIRES). At CIRES, Roger served as the Director of the Center for Science and Technology Policy Research from 2001-2007. … He is also author, co-author or co-editor of five books. His most recent book is titled: The Honest Broker: Making Sense of Science in Policy and Politics published by Cambridge University Press in 2007. Here is a list of his publications. Ok , so global warming and our guilt are all a big con . Dreamt up by a load of Gandi types and other weirdos . How awful it would be if we all acted green . Couldnt fight wars abroad because of carbon footprint and pollution . Couldnt oust native people to drill oil because of the lesser spotted sand mouse . Couldnt burn the rainforests to raise cattle ( or palm oil ) because of the methane . People would have to bicycle everywhere and eat less fat . What a dreadful prospect . Fabius Maximus replies: What are you talking about? Nothing like that appears in this post or any on the FM site. This is the familar technique in 21st century America of making stuff up and giving rebuttal to it. I find it highly annoying. The sign of the PDO changed in (2003? 2005?) so we can expect an ice age hysteria to start around 2030 or maybe even sooner with the heightened interest in climate. Of the two possibilities I’d prefer warming to cooling. Crops don’t grow well under ice. Late 1960s/1970s – The coming doom was the population bomb, which when “detonated” would billions of human beings starve to death as Earth reached its carry capacity. Most famously forecast by the Club of Rome, a group of emminent scholars and scientists such as Paul Ehrlich, associated with the U.N.
Today, another group of “emmiment scholars” – movers-and-shakers from here and there, forecast another doomsday event, this time catastrophic climate global warming, er… I mean climate change (tails I win, heads you lose). Not that I have been listening closely, but has Ehrlich and company ever gone on record about the failure of their predictions? Wonder what Norman Borlaug thought of their work? My grammer was atrocious when composing the previous post — apologies to all. The hour is late. Oh but the idea of continually burning irreplacable fossil fuels just to create electricity is insane. We (and our children and grand children …) need those for chemicals, drugs, plastics .. the list is endless. We, as a World have the technology to replace every coal fired power station (at basically the same price per watt, or in quite a few cases less). Depending on your luck as a nation if you are not investing in nuclear, solar thermal, solar panel, goethermal, wind, wave, etc, etc, etc .. then you are doomed. Plus oil. Peak oil is here today. We have to reduce our wastfull use of oil. Good public tranport, electrically powered trains instead of planes, yes even electric cars. But to continue the way we are going is insanity. If it reduces CO2 production, which some (such as me) worry about, then that is a bonus. A true win-win solution. You don’t have to believe in human climate change to be against wasting irreplacable fossile fuels .. you just have to be smart. I’ve changed this in the post to red type after the third email in rebuttal to my assertion that there was a consensus during the 1970’s about global cooling. It’s astonishing how so many intelligent and well-educated people become dogmatic churchmen when talking about the climate. They hear scepticism and think “heretic” — then read a tract their Shaman passed out last week. The tract is not relevent to the discussion, of course. It is intended to bring the heretic back to the pen of othodox thought. I meant that if the whole global warming thing is a con trick load of rubbish , it could be a darn useful , well devised con trick by scientists to solve a load of problems from imperialism to obesity . Fabius Maximus replies: It is neither a con trick or a load of rubbish. It’s a theory, with considerable evidence supporting it. However that does not mean that it so well-supported at this time to justify massive public policy changes. a lot has been lost in the elevation of efforts which loosely lie in the green/ environmentaist/ gaia worship/ new age fad domain to cult/ conformist status. For the idiot housewife ownership of a prius has become a statement re their committement to conformity and political correctness. in most post industrial western societies strong adherence to traditional religions is falling esp among the young educated( beyond their natural ability to comprehend) set. I think there is a certain amount of converging data opinion, that we as a specie may be hard wired from an evolutionary perspective to belive in a ( for want of a better word) god/ religion ( atheists like myself being a very small minority). The absense of religious bearings in this demographic leaves a void, that is easily exploited and filled with new age mumbo jumbo – the foremost contender being the somewhat neo-luddite green movemnt. Of course as in any religion, there are those who tend to benfit from their exalted status as intermediatories between the puny humans and their gods. Hansen and others in the big science establishment that lives or dies on grant money are one example of these high preists ( see richard lindzen – prof og atmospheric science at MIT), and the other end are the Al Gore’s who are likely to profit big time from proposed environmental regimes. the absurdity of the of some environmental claims is best exeplified by “Save the planet, eat a dog“, Dominion Post, 22 October 2009.
and the way steven levitt has been ravaged about his new book superfreakonomics. bottom line when a serious debate is impossible and treated like heresy, people wanting open debate are treated like apostates and pushed into opposition, cetainly not something i would have wanted, but the rational analytical scientific side of me finds some attitudes so abhorent that I find myself being overly dismissive of the AGW crowd. I cant get why you people are so rabidly anti green . I see ‘ green ‘ as a very promising new way foreward in social evolution. Don’t be anti-green. Greens are good for you and have what your body needs — electrolytes! I see coevolution with greens as a promising path to freedom of thought and action. Mao thought highly enough of greens that he pulled hundreds of thousands of educated city dwellers out of their offices, labs, and classrooms, and put them on the farms to grow greens. Lenin likewise favored greens, and built hundreds of collective farms for growing green cabbages. The potatoes were for making vodka, of course. I like green so much that whenever President Obama is on the screen, I adjust the color so that his face looks green. It gives everything he says a greater depth of meaning. Try it. As cabbage growers , come to dust . I have been able to trace the CIA “study” (reference 26) (albeit I have to confess, I looked for it from a WP 1976 article, not from your blog). I have written about that document in an article printed in The Spectator (UK), it is mentioned in another printed article in Italian daily Il Foglio and I have written a blog about it (all articles have come out on Dec 3). The CIA document is now available in PDF format at the Climate Monitor website.